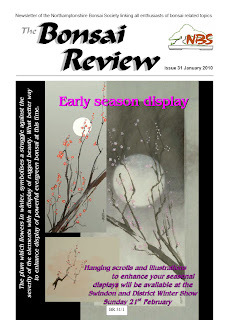 Use the link below for the most comprehensive photo review I can find (so far) of the Noelanders show held this weekend. A link to their comprehensive details is below. By way of an addendum to the AGM notes, Im sure every member of WBS would join in with a big hearty thank you to our departing (literally) chairman Les for all the hard work he has put in during the previous year. Despite the adverse weather conditions 13 members made it to the AGM. Apologies were received from a number of members who were either working or victims of the ice and snow. Andy, Ian Q, Stan, Dave M and the B family, were unable to attend because of ill health, our best wishes go to them and their families. The chairman reported that the club had had another successful year with members exhibiting at Willowbog, Best of British and ABBA. 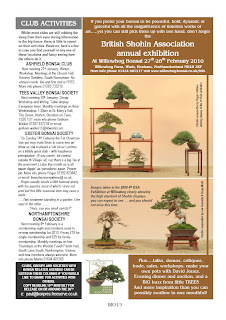 The 2009 club show was extremely successful and a number of bonsai enthusiasts and experts from other clubs attended, Steve Tolley did a pre-selection of trees for consideration for Best of British 2011. The past chairman confirmed that he was standing down from office due to family commitments. As the Secretary and Treasurer were unable to attend the chair gave a brief summary of the current financial position of the Society, we have approximately £260 additional funds since this time last year. 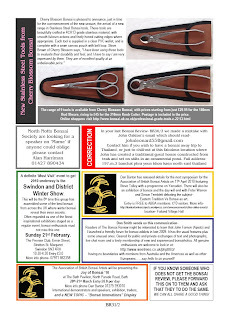 Over £900 was spent on new show staging, material and transport costs, these have been recouped from membership fees, attendance monies and monthly raffles and the raffle at the Club Show. 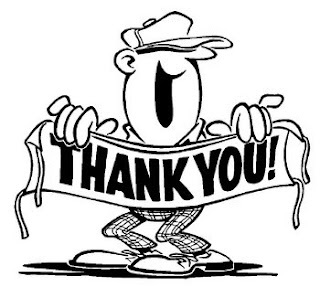 We wish to thank the B family for all their hard work in providing the monthly raffle over the last few years. It was agreed to maintain fees and subscriptions at the current levels, £10 per member and £2 for each meeting attended. Membership figures have increased slightly and we had 35 members in 2009. The position of Librarian has become vacant, thanks for all your hard work Stan. Unfortunately there was no-one in attendance who was able to take on the role therefore it was agreed to discuss the position at the next meeting. 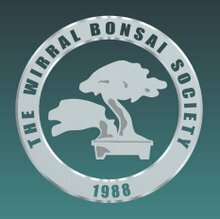 Following our contribution to Japan Day in Liverpool in 2008 the Japan Society have invited the club to provide a bonsai display at Japan Day 2010 on October 17th at the Midland Hotel in Manchester. It was agreed that the Club should participate and the funding for transport of equipment and materials to Manchester be provided. 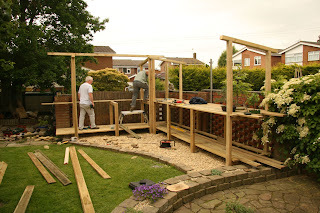 The club have considered making a trailer for transporting materials, however the time to make this and cost etc for this is not viable as it would only be used rarely. The positive arrangement that we have with Gordale enables us to use their transport at minimal cost to the club. It was suggested that we provide more support when we recruit new members at the Club Show, a number of options were put forward. 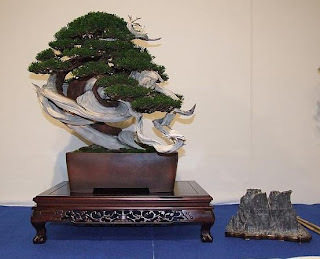 It is proposed that the meeting immediately following the show be focussed on new members, this year we have John Armitage as guest speaker, possibly we could ask him to concentrate on the basics of bonsai and we could ask new member to bring their trees along for him to critique/provide advice. Mentorship and support were also suggested. 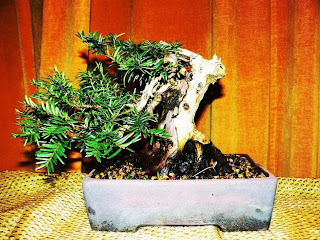 A request to reintroduce a bonsai auction and sale tables was made. Any member trading at the club is asked to pay a percentage of income to the club. In his absence thanks were given to Mark for the service (and income) that he has provided to the club over the last year. 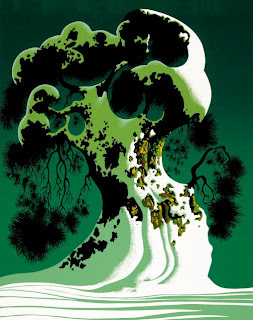 It was suggested that the club design and sell a calendar which includes photos of members trees. Jim, Bill, Brian and Ian Q were charged with costing this out and looking into the feasibility of preparing a calendar ready for sale at the club show and to members. 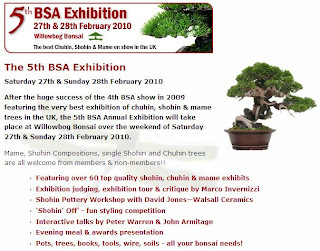 It was suggested that winners of awards from 2009 show and members trees shown at Best of British be included. It was noted that the current Constitution and Rules of the Club require review and possible revision, the new Chair and Vice Chair are charged with undertaking this activity. Included in this review would be the need, or otherwise of the role of Club President. A number of members commented on the tardiness of meetings starting, it is suggested that the meeting commences promptly at 8pm in order to allow speakers to have sufficient time to do justice to their presentation. Therefore members need to be in place, subs paid, raffle tickets bought drinks ready for an 8pm start. This will allow everyone to get the most from the evening. On receiving the above picture it was suggested that "I am sure you could find something nice to say about it !!!!! " Thats as good as it gets! The AGM is BACK ON for this Wednesday due to the thaw. 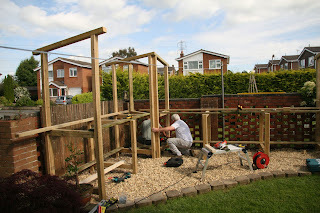 Display table or dog kennel's? Where's the washing line going to go now?
" 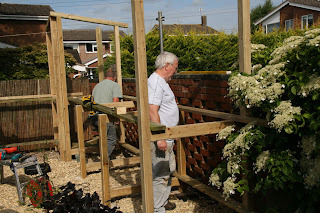 But it says connect end C to end D"
By way of a distraction from the weather and the fact there is no meeting this month this post continues the series highlighting members gardens. The pictures taken by Brian in the summer (sigh....remember when you only had to wear one layer of clothing???) 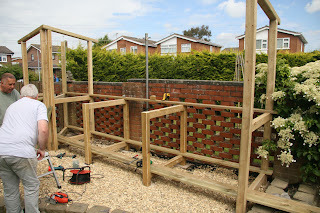 are of Dave B's Garden during his table building project, under the auspices of Dave Y. Please note that this months AGM meeting has been called off due to the bad weather. I will let you know as soon as I have any additional info on any rearrangement. Unfortunatly the above illustrates my current position following a dissagreement with an icy road. On the plus side maybe this overcomes my issue of finding time (4-6 weeks!!??) to improve my wiring skills. 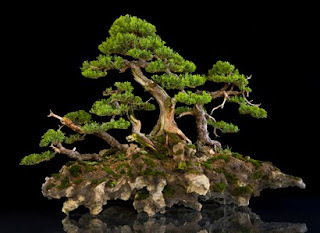 Follow the link below for a review of the winners of the Art of Bonsai Award winners plus links to other interesting stuff!